To understand where the opportunities are coming from, you need to look at the past and how each sector has unfolded to date. You then need to study the metrics that affect each sector to determine what may unfold in the future. Fundamental metrics include interest rates, currency movements, PE and EPS ratios for the short, medium and longer term, dividends and the list goes on. This process is often quite challenging for those new to the market, so shortly I will share with you two easy ways to determine the best sectors to invest in Australia and then I will give you the sectors likely to be the better performers for 2019. Once you determine the best sectors to invest in, you then need to identify which stocks to invest in within that sector, and so your analysis starts all over again. So how do you make this process easy for yourself? In my book, it’s about learning how to read and analyze charts rather than analyzing all of the fundamental metrics, which I will discuss in more detail shortly. For now, let’s take a look at sector investing and why it is a good idea to understand which sectors are performing before you invest. The reality is that most investors just want to manage their investment risk by owning stocks that are rising in value and to identify other stocks that are likely to rise. But here is where things can start to fall apart because investors have been told to diversify their portfolio across a broad range of sectors to minimize the impact of any one sector or sectors that may under perform. In addition, most investors have been taught that the stocks in their portfolio should closely represent the weighting of each of the sectors they are investing in so that they have a balanced portfolio. But let me say this is not a good strategy if you want to achieve good returns. That's because an over-diversified portfolio is exposed almost exclusively to market risk, which cannot be eliminated by diversification. In reality, a well-diversified portfolio only requires you to hold between 5 and 12 stocks. As we know, all stocks rise and fall, and as a consequence all sectors rise and fall. So in the interest of getting good returns, it makes sense to avoid those sectors that are falling in value and to only invest in the sectors that are rising. But how do you do this? Table 1, below, shows a list of the sectors in the Australian market, which are pretty much the same sectors you will find on any stock market around the world because stock markets use a standard classification system for categorizing stocks called GICS, or the global industry classification system. 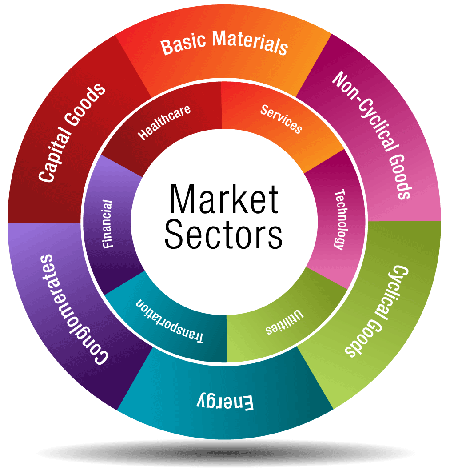 This means you can easily understand what industry (sector) a stock falls into. As you can see, I have listed the growth of each sector for 2018 together with the year to date figures also listed for 2019. In 2018 the biggest loser was the Telecommunications sector, which was down 25.3 per cent, while the biggest winner was Healthcare rising 17.33 per cent. As money continually moves in and out of each sector, we can assume that the best performing sector in one year is unlikely to be the best performer in the next year. This is also the case for the best and worst performing stocks each year. That’s because the industry continues to rebalance portfolios based on the changes to an Index that they benchmark. Looking at the table above, you can see that the Telecommunications sector has reversed its fortunes in 2018 by rising 20.23 per cent in 2019, while Healthcare has only increased by 6.62 per cent. If we look at the next best and worst sectors you will see a similar pattern given that Consumer Discretionary was up around 9 per cent in 2018, only to fall slightly into negative territory in 2019. Financials was also down 14.78 per cent in 2018 only to turn and rise up 3.68 per cent in 2019. While this is only a small snap shot in time, it does show a definite pattern, albeit this example is a little over simplified. That’s because sectors and stocks rise and fall at changing speeds, and sometimes they rise or fall over multiple years. So while this theory is a good guide, it should not be relied on in isolation when deciding which is the best sector to invest in. That said, what this pattern does reveal is that by having a contrarian view, you are more likely to select the next best sectors to invest in. And the exciting part is that once you identify the best performing sectors, you can apply the exact same theory to identify the best performing stocks that are likely to rise in the near future. Remember, it's also important to learn how to profit from share trading so that you achieve your financial goals on a consistent basis. Now let’s apply this theory to a chart to determine the best performing sectors in. As you can see on the chart below, it shows all of same sectors listed in the table above. I have coloured coded the sectors so you can easily recognize each one. For example, XIJ (Information Technology), which is currently the top performing sector, is coloured olive brown. So how do we interpret this chart? By analysing whether the line or momentum within the sector is moving up or down. As you can see, the sectors moving up include XIJ, XMJ (Materials) and XHJ (Healthcare). You will also notice that each sector is moving up at a different speed, which is dictated by the steepness of the lines. So, while Healthcare moved up strongly in 2018, you can see that its momentum has slowed in 2019. 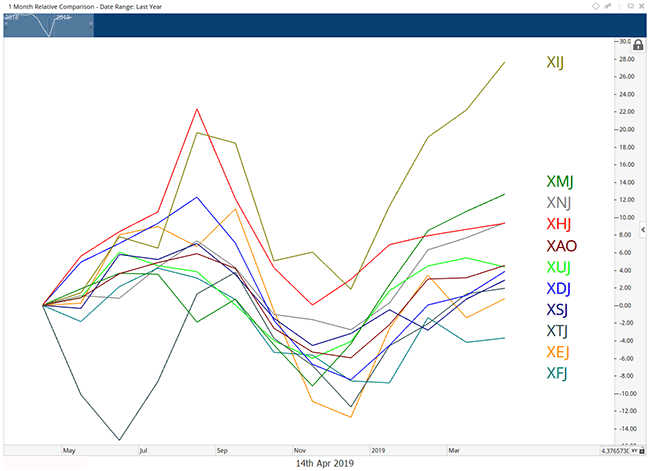 The sectors that are currently moving down include XUJ (Utilities), XDJ (Consumer Discretionary) and XFJ (Financials), with the angle of the line reflecting the speed of the fall. The trick now is to watch the sectors that are falling and to wait for the line to show signs it is turning to rise, as this is the sector that will most likely provide opportunities in the future. For example, notice that XEJ (Energy – yellow line) has recently turned up in price, so I would be looking at the Energy sector for stocks that have also just started to rise. Another way to analyse the chart, is to look at the steepness of each line. If a line is rising slowly and then starts to increase in speed, you would know that the stocks in that sector were starting to move faster and so may represent some good opportunities to invest in. What are the best sectors to invest in 2019? So what other sectors will perform well for the remainder of 2019? Based on the chart above, I believe the Financials and Telecommunications sectors will most likely turn to rise later this year. The analysis also indicates that the Materials and Information Technology sectors have a little further to rise. I also anticipate that the Healthcare, Consumer Discretionary and Consumer Staples sectors will remain slow for a while longer. So there you have it, two really simple ways to identify the best sectors to invest in.